Media: Soft cover; 48 pages plus covers; A4 Format; glossy paper; full colour with colour and B&W photos. Advantages: Plenty of photos; broad subject coverage with main focus on WWII and Post-War German military equipment. Recommendation: Recommended for modern armour fans, and German readers in particular. Tankograd Publications produce a regular Gazette on the subject of Soviet and Eastern Bloc vehicles. They have also released a number of specials on particular vehicles. They have now launched a general reference magazine with broad subject coverage, but focussing on WWII, post-war and modern military equipment. The premiere issue is presented in A4 format over 48 glossy, full colour pages. Almost every page has between one and six photographs. The pictures are sharp and relevant. Text is in German but a two-page English summary is supplied at the back of the magazine. East German Armoured Vehicles - Where Did They Go? Each article is between a half page and six pages long with plenty of supporting photographs. 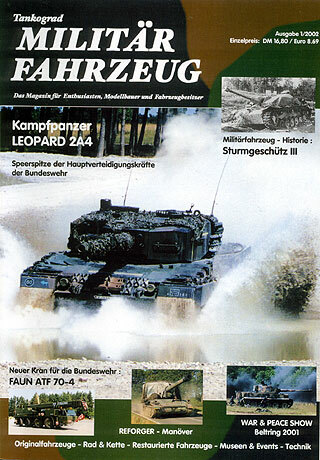 The highlights of this issue for me include the Leopard 2A4 article (the less glamorous relative of the 2A5); the East German "Where Are They Now" article including a photo of 1500 T-54 and T-55s awaiting disposal; and the photo feature on late variants of the Sturmgeschutz III. This article has a series of photos with late Stugs in waffle pattern zimmerit exhibiting unusual features - non-standard superstructure armour and headlights, additional armour from track lengths and, odd stowage. With their damaged fenders, chipped zimmerit and peppering of small arms damage, these would make a really interesting modelling project! This new magazine will be appreciated by modern and WWII German armour fans, and German-language readers in particular.